No matter what type of small business you run, it’s likely that your drawers are full of receipts that you just haven’t had time to sort out yet. Although you may feel like placing them all into a cardboard box and giving them to your accountant at the end of the year, a better idea is to keep a record of your receipts. Not only will this help you to save time (and possibly money) at tax time but it will also prove useful should anything unforeseen happen to your business such as a flood or a fire. So, without further ado let’s take a look at three of the best apps currently available to both Android and iOS users. You’ll wonder how you ever went without them! Concur is the ideal solution for businesses of all sizes; in fact there are two different versions of this app – Concur Premier for medium to large businesses and Concur Breeze for small businesses. Both apps enable users to report and file expenses whilst on the move and there are also options to receive automatic notifications when a business credit card is used and take photographs of receipts and expenses to digitalise them. With over 500,000 users this is a hit with many business owners. Concur Breeze is currently available for free on a 30 day trial so is definitely worth trying out! If you thought expense reporting was hard and boring, think again. Expensify is another popular expense reports app (available for Android, iOS and Windows Phone) that enables you to track everything from business travel to stationary receipts quickly and easily. One of the best things that this app is able to do is scan a receipt and create an expense entry automatically just by reading the information. This saves you from having to do anything, aside from scanning the document. Ten of these can be done for free and after that the price is $0.20 per scan which is cheap in our opinion, especially when you see how much time you could save. With over 1.7 million users currently using the app, it’s got to be good! Expensify is free for individuals and $5 per month for companies (aside from the extra fees mentioned above). 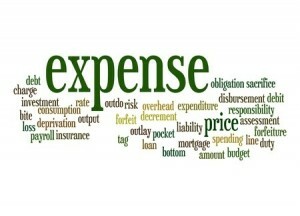 Expense Cloud is an expense reporting system that is currently used by over 10,000 users. Available for almost all devices, it provides companies with everything they could possibly need to monitor their outgoings. Ideally suited for small to medium sized businesses, it can also be linked up to some of the most popular online software including Fresh Books, QuickBooks, Intacct and NetSuite. Receipt scanning is possible from Blackberry, Android, iPad and iPhone devices and credit card expenses can also be directly imported into the app. With the aim of saving businesses time, Expense Cloud is definitely an app to look out for in the future. It is currently available for a low cost monthly fee depending on the size of your company and the number of users. This is actually amazing, because some of the business owners are just too busy to track down their expenses, they still have to hire accountants to do it for them, but with the help of these applications, I bet they can easily monitor it.